Strange how technology and fashion are making 360 circles. 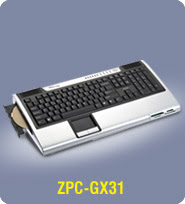 Who remembers the old Commodore VIC20? I still have mine, on display in my study. I do not have the PSU or tape drive anymore, but still have the machine. Now you can get a modern Intel processor machine, all in a keyboard! Just like the old days! Cybernet (http://www.cybernet.com.tw) has build this little machine to be a Zero-Footprint-PC. With up to Intel Core 2 Quad CPU, 4Gb RAM, 500Gb SATA Hdd and Intel 3100 GPU, this little machine should run Windows 7 no problem. What next, return of Burning Rubber?